I’ve been eating a traditional diet for over 10 years. This diet is inspired by the work of Weston A. 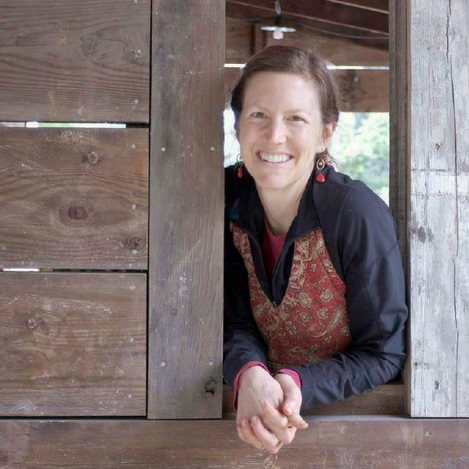 Price and the book by Sally Fallon Morell, Nourishing Traditions. These educators helped many of us to understand how to prepare food for better digestion and which nourishing foods to feed to our families for optimum health. One of these foods is organ meat. Organ meat is loved by some and shunned by others. This recipe is an excellent one to try if you’re in either category. 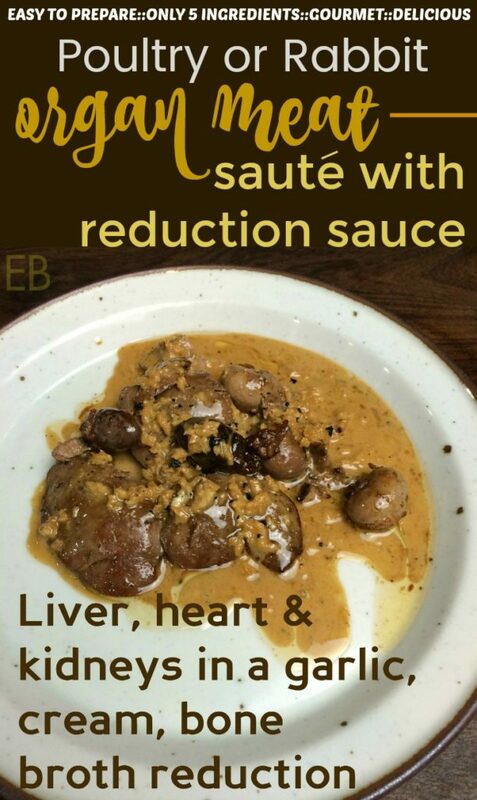 This recipe uses many small organs, kidneys, hearts, livers from poultry or rabbits, so it’s especially ideal if you happen to raise these animals, or if you buy several animals from a farm– so you “come into” the small organ meats from several animals at the same time. 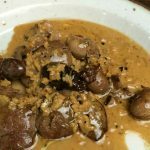 But a good alternative is just to buy the organ meats from a pastured farm, separate from the animals, or from a natural foods market, where you can often find chicken livers. The hearts and kidneys offer a really nice potpourri; so ideally you can get your hands on all three. The rabbit organ meat we recently ate was, hands down, the best organ meat I have ever enjoyed. If you’re raising rabbits for meat, or buying rabbits from a local farmer, don’t neglect these gems. The livers are small compared even to chicken livers, in their thickness. So the texture is more subtle and delicate. 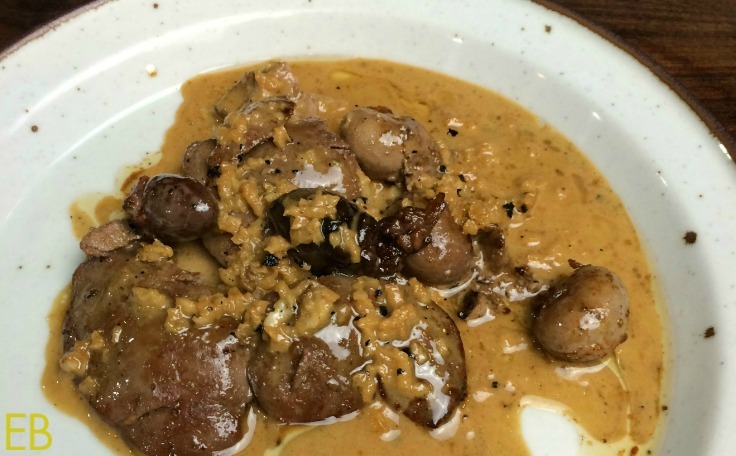 The kidneys are mild and yet flavorful, pleasant in texture. The hearts, well, almost everyone loves hearts. They’re a muscle after all; so they taste meaty. They are a bit chewy, but in a nice way, and can be cooked to medium, not well-done. This Garlic Cream Bone Broth Reduction Sauce borders on heaven. Here’s the recipe! After the organs have been sauteed, place them in a warm oven or on pre-warmed plates while you make the reduction cream sauce. Add butter, garlic and sea salt to the same pan, over low heat. Shortly after garlic begins to sizzle, about 30 seconds, add the broth. De-glaze the pan by scraping up any bits of organ meat with a spatula. Turn the heat to medium, just until the broth comes to a boil; then allow garlic to simmer for 3-5 minutes over low heat. Add the heavy cream and reduce the sauce for an additional 2-3 minutes. Serve the organs on individual warmed plates, spooning the reduction sauce over the meat. Need a great cast iron skillet? Here's a good medium size for this and many recipes. By the way, please share this recipe! (You can pin this image.^^^) There aren’t enough recipes for organ meats. We want everyone to know what to do with what they’ve got! And rabbit should be enjoyed more often as well. Thanks and cheers! I love rabbit, I have a friend who raises them. I still have trouble adding organ meat to my diet. I’m struggling…for real. I will try though, since I get rabbits regularly from our friends. Thanks for the recipe! Sounds delicious, especially the sauce! I’m not sure where I’d get organs from 4 rabbits, unfortunately. I might try to use the sauce on some beef organs. LOL, bit by bit, maybe some day. So glad you guys will have rabbits; they are so yummy!! What an amazing experience for your daughter to raise them. We hope to one day. I haven’t had rabbit in awhile. My neighbor usually brings us some once a year when he goes hunting. I know organ meat is good for me, but I haven’t been brave enough to try them straight yet. My husband would love this, though! He likes to call the rabbits in the back yard “dinner.” Luckily for the rabbits you can’t discharge a firearm in our city.